Posted on November 7, 2017 . 21 Comments. One of the hallmarks of the strength training concepts taught through StrongFirst is the emphasis on controlling breath. In particular, there is emphasis on the use of the biomechanical breathing match to create the most effective force and tension during a given exercise, allowing for better production of power as well as increased endurance. 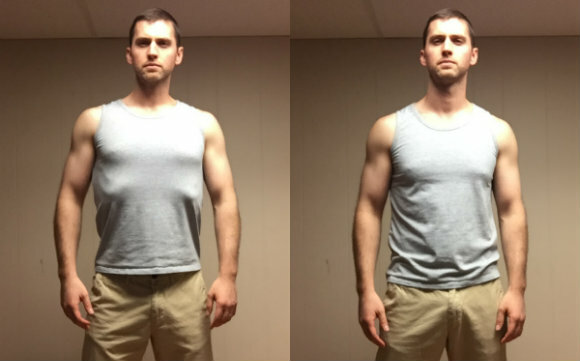 This breathing is taught with nearly every movement trained, and it is combined with maintaining the most effective position of the torso, typically holding it in a general neutral. From here, pulsed partial exhalations are taught to create sharp increases in intra-abdominal pressure, and maximize potential for strength in any movement performed. However, for this pulsed exhale to be effective the ribcage and diaphragm must “oppose” the pelvic floor. Let’s take a moment to better understand the structure we are talking about. We could easily define the midsection as the area between our thorax and pelvis. The top boundary is the diaphragm, and the bottom is the pelvic floor. In matters of strength, endurance and even general comfort, we want the two ends to oppose each other and form a piston. This is needed to create a durable position for the spine, ideal length-tension of the surrounding musculature, and most notably to drive pressure down into the abdomen. Left: rib flare; Right: no rib flare. This is clearly not a posture of strength and is problematic to any trained eye. Often rearing its ugly head in scenarios involving challenging overhead movements and/or general fatigue, the rib flare robs the individual of his or her potential strength. Strength training performed with a flared ribcage literally sets us up for injury—the back will be strained, the abdomen disengaged, and the torso held in an awkward position under the neck and shoulders. For any strength goals to be met, injury must be avoided for our efforts to be consistent. Thus, rib flare must always be caught and corrected in ourselves and our students. The common cue to correct the rib flare is to encourage the individual to “drive the ribs down,” sometimes simply stated “ribs down.” Unfortunately, common usage does not guarantee effectiveness. This cue works for some, but not for others. A cue or drill is only useful when properly matched to the individual and problem. Typically, the rib flare is simply due to hyperinflation of the lungs. Rib flare could be accurately understood as a tense diaphragm, holding and maintaining air in the lungs while a disengaged abdominal wall allows the ribcage to float away from the body. There are two general ways the body holds itself up against the demands of life, gravity, and whatever we choose to take into our hands: muscular tension and intra-abdominal pressure (IAP). Learning to create maximal tension throughout the body is a hallmark of the StrongFirst system, but we must have effective IAP in particular in order to keep the torso from crumbling. This is where position is key to leverage, and the midsection is no exception. When rib flare is present, it is air that is in the way. Top: No rib flare; Bottom: rib flare. Remember that we want our diaphragm and pelvic floor to oppose each other and form a piston. To create effective intra-abdominal pressure, there must be a combination of the ideal position of the two ends to create leverage, as well as tension around the piston to contain it. Air is used to modify the pressure—first, to pull in to drive down and pressurize the piston, and, at other times, to further pressurize the piston via pulsed bursts of small exhalations. When the ribs are flared, the position of the diaphragm is not set to drive pressure down into the abdomen, but out and away from our bodies. Power breathing efforts will then strain the spine, not support it.1 Thus, if the ribs flare, it must be corrected. The way to correct rib flare is not to simply hunch down (a common mistake), but to sufficiently exhale to lower the ribcage immediately prior to bracing. We could correct the flared ribcage position by simply hunching over, and although this would position the diaphragm over the pelvis, it would still not be an advantageous position to work from. We must be able to hold our diaphragm opposing our pelvic floor, and still allow our ribcage and thoracic spine above it to move freely for whatever task is being taken on (for example, the upper back must extend with presses and even more so with jerks). How do you know if the bottom of the piston (pelvis) is facing up? For the vast majority of us, this will simply be present when we have equal weight distributed between our heels and balls of our feet. Some people with a history of a lot of ballet or dance may have a disconnect between their feet and this reflex due to years of training, but for the rest of us, we should be able to trust this reflexive coordination. Take your hands and place them on the lowest portion of you rib cage. From here, stand up straight. If you feel your ribcage sticking out once you are standing straight, that means you tend to go a little too far. You are likely hyperextended, hyperinflated, and not set up for success. So, exhale until your ribs disappear. Now your diaphragm opposes your pelvic floor. If you curl your torso down to achieve this then you are hunching over, again not a set up for success. Perhaps an alternative cue to correct rib flare is not simply to “drive ribs down,” but to “blow ribs down”—allowing ourselves to release the air that is blocking us from the most ideal position. It’s possible you’re thinking, “Can a little bit of air make all that much of a difference?” A pebble under your heel would ruin any squat or swing, and with that a pair of lungs too full has its danger. Minor details make all the difference in matters of strength and leverage. 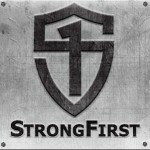 The StrongFirst model seeks to deconstruct, translate, and simplify what the strongest do naturally. We seek to understand the most capable and in turn emulate. Equal insight can be considered through understanding what the least trained among us tend to do. Emulate the strong, be cautious of the weaker habits. How we manage our air is crucial both for strength, as well as durability. Consider that low back pain is more associated with respiratory disease and incontinence than obesity and activity levels.2 If you cannot manage air or pressure, the spine is more likely to buckle. Rib flaring is no different than other common compensatory strategies the human body will often take under strain or fatigue. If the shoulder shrugs during a press or a heel lifts during a squat, swing, pistol, or deadlift, leverage is lost and injury becomes likely. A concept taught through StrongFirst is that of learning to fail well and never sacrificing the form of a movement in the pursuit of its mastery. Fix the ribcage over the pelvis, control your air, and enjoy the positive effects it will have on your strength pursuits. Noah holds a Doctorate degree in physical therapy, specializing in the treatment of orthopeadic and sports related injuries. He has experience in rehabilitating a wide range of individuals, spanning from collegiate and professional level athletes, to the deconditioned and chronic pain population looking to regain a comfortable and active life. Noah has found the principles of strength training taught through StrongFirst to be priceless in aiding his ability to help nearly everyone he works with reach their goals. He has his own private practice, Portland Integrative Physical Therapy LLC, which offers both rehabilitative as well as strength and conditioning services to the general public in Portland, Maine. He is best reached via his personal website www.noahharrisondpt.com. Noah has found the principles of strength training taught through StrongFirst to be priceless in aiding his ability to help nearly everyone he works with reach their goals. He treats and trains in Southern Maine, and is best reached via his personal website, NoahHarrisonDPT. This is a good article. A lot of people who are “more naturally talented” in weightlifting and or other athletic pursuits might find discussion of how to breathe or brace oneself as absurd as it is “simply common sense” to them but in depth discussion of such ‘simple things’ is in fact hugely beneficial for legions of others who might otherwise hurt themselves seriously and or achieve more mediocre results despite good dedication and efforts….. Your article was recommended to me by Jody Beasley, and it was exactly what I needed. I used this knowledge during my workout last night, and today I don’t have my usual tightness in my back or hips. My front squats were the most solid they’ve been, with my torso and legs working in synchrony. Thank you for the share. Jody is the man, and I am glad to hear you had such improvements. This was well explained, thank you. And the photos and videos are excellent! I have what might be a dumb question. I am confused between what you are doing to solve rib flare and diaphragmatic breathing. With the latter, on an inhale, the diaphragm would lower; the belly would distend; and the lungs would fill with air. Result: no rib flare? On an exhale, diaphragm rises, belly goes in, lungs release air. Result: rib flare? So I’m confused. Does rib flare result because people breathe more from the chest? Not a dumb question at all Dennis, but perhaps one that would be better answered with visuals, not just words. Regardless, I will try. Rib flare is when the abdominal wall disengages and the lungs excessively inflate. Think of your diaphragm as a parachute, and your abdominal wall the lines that pull it down. Without sufficient tone in your abdomen to hold the diaphragm down against the forces of pressure (air, guts), the diaphragm will bow out, much like a parachute with a cut line. Ribflare is really like a stutter or stammer; we will all do it under sufficient stress or strain, and some will do it more often and more readily than others. For some, the strain of gravity is enough to hold them there. Reducing ribflair, forming habits, and integrating this into strength training is akin to learning effective, clear concise diction. I hope the above helps more than confuses, if you would like more insight into breathing mechanics, I would look into some articles I have on my personal website. Thanks so much for your reply! I think I understand your explanation. I do appreciate your analogy to a parachute; it helps to visualize things. I will be sure to check your website for more information. Thanks again. Excellent article, thank you Noah! You are welcome Kerry, glad you enjoyed it! Wow. Knew from the title of this article that it as a game changer for me. Reading this article, I could literally feel my rib flare at the bottom of my swings and phases of Get Up. You are welcome James, I hope keeping these things in mind helps with your training going forward! Great to see a fellow PT contributing. 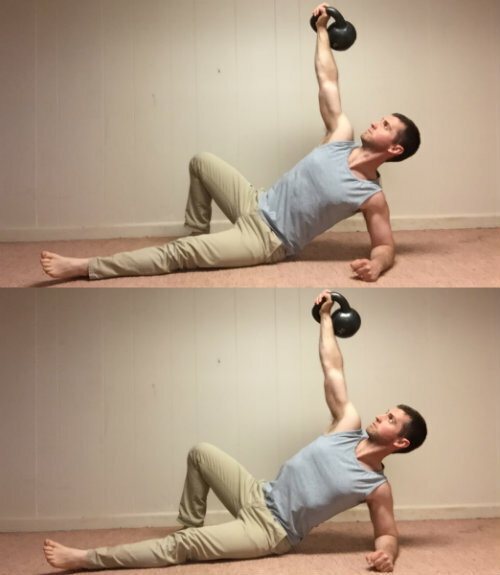 I’ve been using Kettlebells with my patients for only a year, but it’s going very well. Still trying to determine optimal timing for including KB for post RCR patients, such as static bottom up holds in supine. Kettlebells (and all the knowledge necessary to use them well) are priceless in rehabilitation. Feel free Brian to email me if you would like some insights about when to add such drills in during certain recoveries. WOW, never even thought of this. Very informative, thank you very much! You are very welcome Marcus! As someone who does this I find this really useful. Unfortunately some of us just don’t naturally “get it” & need these sort of cues. This is a very common compensation, and so you are not alone. Glad you find it helpful Cearball! I don’t want to hijack this great post, but with my clients I’ve found the “dead bug” exercise (and it’s various (pro/re)gressions are fantastic. Having the back on the ground is a great proprioceptive cue to feel if the ribs flare/excessive lumbar arch occurs. I agree wespom9, getting a person on the floor is a great way to help them feel these tendencies. The challenge and art is often found having them feel and own this position in the many ways of being upright.